Evoke, invoke and provoke are rhyming words and are interlinked too. They are used in different contexts but are very similar in meaning, hence can be easily confused upon. In this grammar.com article, let’s discuss each word in detail and understand where each has to be used. · Seeing their daughter getting married evoked a lot of old memories. · His character of a comedian in the movies evokes laughter. · Going to my hometown evoked lot of childhood memories. · The controversial movie scene evoked strong reactions from the critics. · This part of the novel is going to evoke mixed response from different groups. The word invoke is used in multiple ways. · The candle light march invoked a spirit of unity amongst all. · The sage performed a series of ceremonies that invoked the deity from meditation. · The code wrongly invoked web services when it was not required. · She invoked the auto-destruct sequence since they couldn’t decode the computer’s password. · The president invoked a law to provide free education to the children of martyrs. · The voice of her friend evoked memories of my science teacher. · Tom invoked the help of his neighbours to raise funds for the event. · The lawyer will invoke the necessary laws if someone tries to mess around. · The prayers evoked a sense of relief in everyone’s mind. To provoke someone is to incite or arouse in them strong feelings to feel or do something, most of the times, making someone irritated or angry. · The Prime minister was provoked many times by the opposition leaders, but he remained focused. · Don’t provoke me unnecessarily, I know what is right. · The teacher provoked the student to face more challenges. · His controversial story provoked a series of protests from some sections of the society. Notice, that evoke is a synonym of provoke, however from the examples we can see that both are used in different contexts and situations. Evoke is mostly used with memories, response, images or sense. The memories or images could be good or bad. However, provoke is all the time used in a negative way. In the above sentence, we can also use evoke, since it is based on deeper feelings and beliefs and is a result of another main action. Invoking god by the means of prayers evoked a lot of faith in my mind, but it provoked some people who don’t believe in god, as they felt it wasn’t real. "Evoke vs. Invoke vs. Provoke." Grammar.com. STANDS4 LLC, 2019. Web. 22 Apr. 2019. 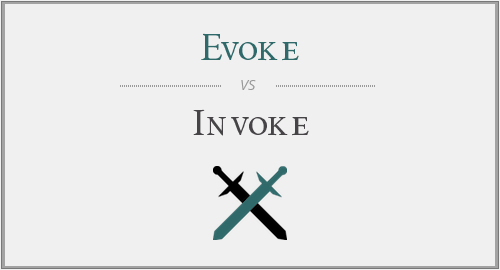 <https://www.grammar.com/evoke_vs._invoke_vs._provoke>.